If you’ve played Texas Holdem or any other poker game on the internet, or even if this is the first time you are looking for an online poker room to play at, then you will find the information helpful. In this article we would like to introduce you to the smaller and lesser-known poker rooms, most of which are still VERY MUCH worth playing at for different reasons. So to start off, you may be wondering, “Why play at a smaller poker room?” Well naturally, the big poker sites like PokerStars and Party Poker have their obvious advantages – the poker traffic is bigger, more cash game tables and tournament action and they have great rewards programs – but what a lot of people don’t realize is that there are so many added benefits by playing at smaller, fishier poker websites. Strangely enough, I have found that the overall skill level of players in the smaller rooms is lower. You can find weaker players in the smaller rooms (well, in some of them). It’s why profitable players play the game – it’s not just about competition, it’s about FINDING THE FISH baby! You can hone in your game by playing smaller stakes or even play money games, all while building up experience and your own bankroll. You’re not under constant pressure by sharks like you would at the larger rooms, because frankly a lot of those players stick to what they know best and stay loyal to those types of rooms. This gives you an advantage in becoming a shark for yourself and picking off the fishy players and the softer ring games that most smaller poker sites offer nowadays. Moreover, many newer poker sites like BetOnline Poker are also willing to offer attractive sign-up bonuses to new players and unique software features in order to keep them playing at their site. This also allows players to have added incentive to not just win, but to also play more volume to earn their bonuses and VIP points that can go towards items or tournament tickets (assuming your site has a rewards program, which most do). In addition, these bonuses and software upgrades are sometimes even better than what the biggest and most popular poker rooms out there are offering at the moment! Overall, I truly recommend not playing just a single site. One poker site is better for tournaments and the other for cash games. One is better for Texas Holdem players, and another for Omaha or Stud players. Picking, choosing and separating which rooms hold different preferences for you is very important, so ALWAYS keep that in mind when it comes to your selection. Take a look at the different sites – choose 2, maybe 3 – and start playing. 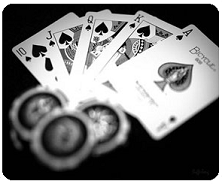 You will soon find which site suits you most and you will have your online poker bankroll spread on different sites. The best deal is to keep an account at one of other major sites, in order to find a quick game or tournament – and then maybe one or two accounts on smaller sites, where you can receive bigger bonuses and fry the fish that come there. You can download the software client from our review pages at G666 or check out the site first before selecting a proper poker download.